Give your classroom a boost of color and fun with this cheerful Alpha carpet. 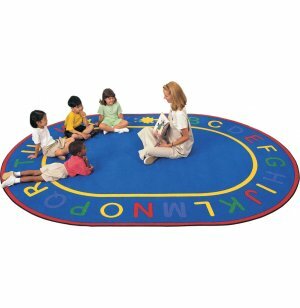 Multi-colored letters stand out on a bright blue background, making this carpet ideal for letter recognition and educational activities. KIDPly backing system provides extra softness as well as durability, and carpet-guard stain protection prevents daily spills from ruining carpet. The Alpha carpet meets all fire code requirements and is unravel and fray-resistant. 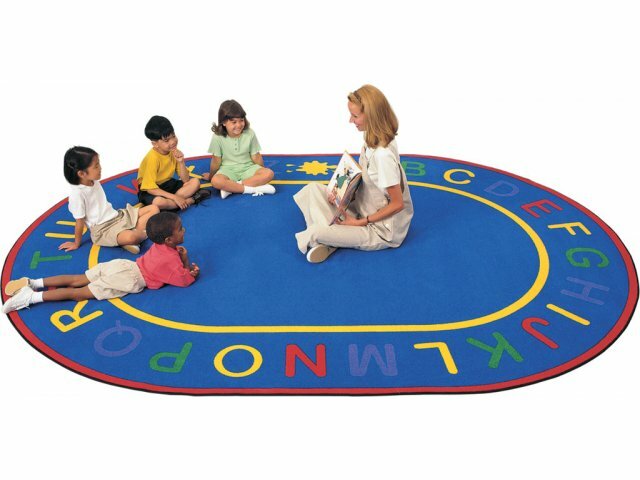 Perfect for circle time and manufactured with top-grade, made-in-the-USA quality, this colorful carpet will serve your school for years to come. Carpets for Kids manufactures educational rugs for daycare centers and schools across the U.S. Adorable designs and top quality manufacturing ensure that CFK's carpets provide years of learning fun. Child-Friendly Colors: Bright colors add cheer to any learning environment. Stain-Resistant: Carpet-Guard treatment protects carpet from everyday spills and stains. Super-Durable: Increased fiber density, double-stitched 3-ply nylon serge and KIDPly backing system prevent carpet from fraying, piling and unraveling. Fire-Safe: The Alpha carpet meets all fire code requirements. Extra-Hygienic: A lifetime anti-microbial treatment and antibacterial treatment guard against mold, mildew, fungus and bacteria.